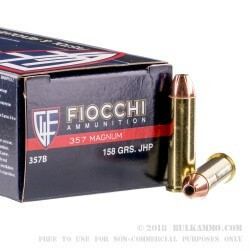 Fiocchi's bulk 357 magnum ammo complete with expanding hollow point projectiles! Fiocchi's history is one of the most interesting in the industry with roots dating back more than a century all the way to a family-owned (and started) business in Italy. 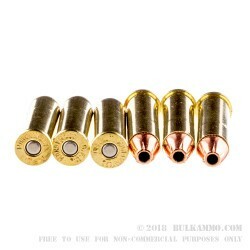 That history and experience shines through in these 158 grain jacketed hollow points. Featuring brass cases and boxer primers, these casings are reloadable if you're the type to gather them up and hit up the reloading press after range time. 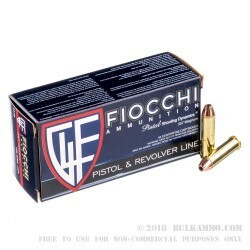 Let's talk ballistics - Fiocchi reports you should expect a muzzle velocity of about 1,220 feet per second when firing these loads. 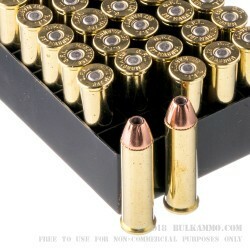 This ammo will arrive at your door with the full bulk ammo case. Inside, you'll find 20 individual Fiocchi 357 magnum ammo boxes with each containing 50 rounds ready to fire. Not ready to take the plunge with a full case? We also sell this 357 mag by the individual 50 round box, you can find those for sale here.